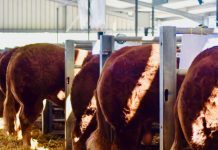 The Blue Riband Burke Trophy was contested at the Devon County Show held over the three days of May 17th to May 19th. 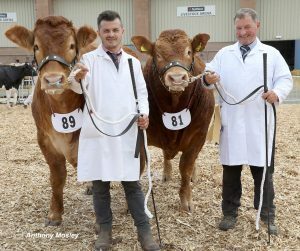 The beef trophy, judged by Mike Yeandle, who has a herd of pedigree Devon cattle near Dorchester, delivered a runners-up spot for a pair from the Foxhillfarm stable of Mike and Melanie Alford, Cullompton, Devon. 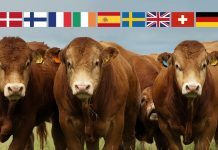 The Burke Trophy, a highlight at the Royal Show between 1951 and 2009, has since moved around the country to different shows to be presented to the best pair of beef animals – one male and one female – chosen out of all the breed classes at the event. 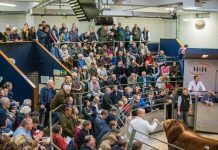 The show proved to be a great success for the local Foxhillfarm team. 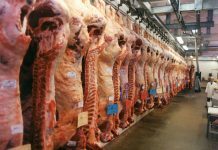 In the Limousin section under Judge Eric Norman they were placed first a number of times. 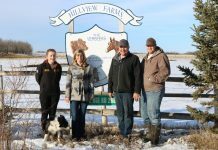 They took the Male Championship with Foxhillfarm Napoleon, an April 2017 born son of Foxhillfarm Jasper out of the record priced female, Glenrock Illusion. On the second day of the show Napoleon stood as Junior Interbreed Champion. 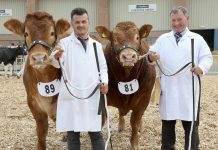 In the female section, Foxhillfarm Naomi first won her class and then went on to secure the Female and Overall Limousin Championship. Naomi is by Trueman Jagger and out of the Wilodge Fantastic daughter, Foxhillfarm Isla. 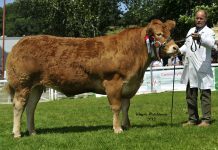 She went onto secure the locally bred Interbreed Championship. 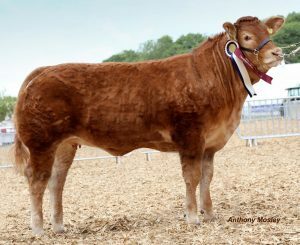 Having won her class, Foxhillfarm Minesagin stood as Reserve Female Limousin Champion behind Naomi. This September 2016 born Jagger daughter is out of the Loosebeare Fantastic daughter, Foxhillfarm Justtheone. These three teamed up to stand as Interbreed Group of Three Champions and then in the coveted Burke Trophy championships, Napoleon and Minesagin paired up to take the reserve spot against a super pair of Blues. 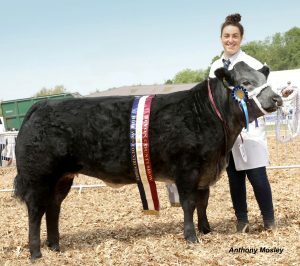 Lin Calcraft took the Commercial Beef Championship with her 14-month old Limouisn/Blue crossed heifer Snow Gin.